ot the typical post you'd expect to see here, but as a lot of what I'm going through right now would apply to any predictable natural disaster, it never hurts to be prepared. I moved to Grand Forks, ND in the spring of 1996 to be with my hubby right after we became engaged. We spent many weekends blissfully planning our wedding and house shopping for our first home. We found a 100 year old house which had been added on to and remodeled several times and we going to need a lot of TLC, but the price was right. Because of the crazy amount of snow we got that first winter and the ice storms and quick thaw that spring, I started to hear talk around town about flooding and needing flood insurance. 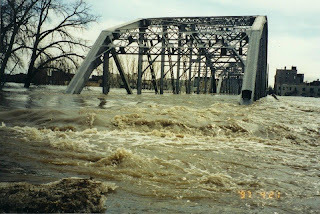 I was new to Grand Forks, I had no idea that the river "flooded" every year. Most years it's no big deal, the river always leaves it's banks. That year people were talking about a record flood though, so I started pestering my soon to be hubby about flooding and flood insurance. 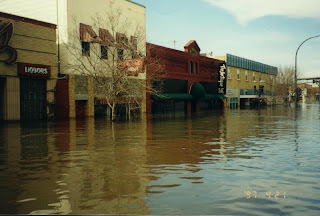 We bought flood insurance on March 15th, it takes 30 days before it kicks in, and the river broke through the sandbags and all the city's efforts on April 17th. Since then, flood walls have been put in place which protect us to 63' and the levees to 60'. 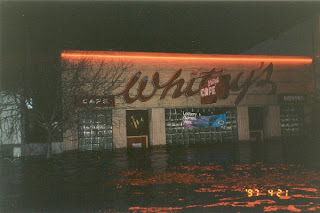 In 1997, our preparations consisted of hauling everything out of the basement and main floor up to the second floor the night before we flooded. No one really thought it was going to flood, until it was happening. The assumption was that it could be stopped with sandbagging. We left our house at 3am when the sirens went off in our neighborhood and we headed west. We had a small suitcase with a few days worth of clothes, and our puppy. We thought we'd be coming home in couple of days, and had no expectations of water getting to our house. We stopped at a friend's house about 30 miles west, in Larimore, for the remainder of that night and then continued on to Devil's Lake to my brother-in-law's in-law's at the time. We were ill-prepared for the reality of the situation, we were gone for a little over 2 weeks from Grand Forks and our house was uninhabitable for 3+ years. Yes, you read that correctly, years. Our basement completely collapsed and we had flood insurance, but it was 3 years before we finally got a check to cover the repairs. In the meantime, we moved to Illinois to get a bit of a fresh start and continued to make mortgage payments on two houses. In retrospect, maybe we should have just walked away, we had been in the house just under a year, but we didn't. We moved back to Grand Forks in 2002, back into the same house with it's new basement. We have since sold that house and now live on the south side of town in a single story home. We no longer have a second story for our belongings and the water levels have been rising yet again. Fargo is currently scrambling with sandbag central, and we are expected to get an awful lot of water. Thankfully, as the month winds down we are no longer expected to flood here in town in Grand Forks, if the flood walls do their job. We still have a lot of water and it's supposed to snow 8 out of the next 10 days. My backyard is starting to look like a swimming pool. The ground is so saturated that there is nowhere for the water to go. As of 2 weeks ago, I was beginning to prepare for a flood and figured this information may be helpful to some. My biggest concern at this point is sewer backup and ground water. I'm assuming the flood walls will hold. Determine the safest route to leave town from where you are in the event of a natural disaster requiring evacuation. Have a family meeting and form your family emergency/evacuation plan. Depending on the circumstances family members may not be together when the time comes to evacuate. You need to designate a safe place to meet up. Make sure everyone has phone numbers and addresses of determined meeting places. Determine a point of contact outside of the affected area that people can call to get updates. You don't want everyone calling your cell, when you might be needing it for emergencies. This way you can keep one person completely informed and they can relay messages to other family and friends. Put together copies of all important documents including proof of immunizations, proof of insurance and phone numbers to call to file claims. Include a home inventory and a video of your possessions. Yes, you can document them as you are cleaning up the wreckage, but pieces may break, be gone or be otherwise unrecognizable after a disaster. Put together a large plastic tote containing battery-powered flashlights and radio, first aid and medications, rain gear and warm clothing, sleeping bags or bedding, several days worth of canned foods and bottled water (at least 3 gallons per person), a can opener and any other personal items you must have for health and safety. Check with your insurance agent to determine if you are covered and what steps need to be taken in the event of a natural disaster. For instance, flood insurance has a 30 day waiting period before it is active. Depending on the natural disasters common to your area you may be required to always carry coverage, or just carry coverage during times when the possibility of a disaster is increased. Learn how to shut off your water, electricity, gas, etc. in case you are instructed to. Install backflow plugs or valves to help prevent sewer backup. A flood watch/warning has been issued for your area, now what? Notify the local authorities if you have someone living with you that may require a medically assisted evacuation should flooding become imminent. Keep your gas tank full and your vehicle ready to go at all times. Keep the emergency tote in the vehicle and your important paper copies easily accessible at all times. Pack a suitcase with 4-5 days worth of clothing. Be sure to include at least one pair of workboots/sneakers, jeans and work gloves per adult, if you come back to devastation, you don't want to be walking through it in sandals and shorts! Review with your family your evacuation plan. Keep your cell phone charged and charger handy. Let family and friends know who the point of contact will be outside of the flood area. Move all furniture and valuables to the highest point in your home. In a single-story home this may mean piling everything on top of tables, beds and counters. Bookcases may topple, keep that in mind for valuables. Pack up whatever irreplaceable items you can to take with you. If you have a lot of irreplacable items, and disaster is imminent (not if, but when) then consider renting storage on higher ground for your items. Keep yourself informed and stayed tuned in for updates on the weather forecast. Take evacuations seriously! Nothing is worth your life. Leave as soon as you are told to. Don't drive into standing water, abandon your vehicle if it stalls in water. Get to higher ground as quickly as possible. If there is a danger of flash flooding, be prepared to leave at a moment's notice. You may not have much, if any, time to get to safety. For further information, I recommend reviewing the CDC's Preparedness for All Hazards and the Specific Hazards information for the disaster most likely to affect you. In the meantime, I feel for those currently being evacuated in neighboring cities, and hope we are kept safe. I don't know who took these, I would guess a reporter. 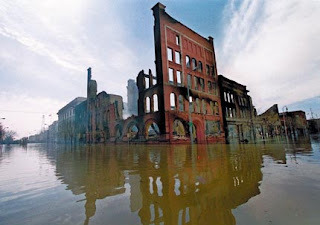 The last image is of the fire-damaged buildings downtown, and made the cover of many national newspapers in 1997. Edited to provide credit: my friend Becca said these were taken by Eric Hylden of the Grand Forks Herald and he received a Pulitzer Prize for the photos he took during the flood. Oh wow. When I first read 3+ years - I did think it was a typo! I can't believe you guys came back. I don't think I could have. When we lived in Japan it was a requirement that each person must at-all-times have a duffel bag packed and within easy reach of the front door. We had typhoons there, something fierce. We were lucky, we lived up on the side of the mountain in a pretty safe spot, but there were times we got nervous. We were never told to vacate (thank goodness) but there was a couple of times we made the decision to head inland and stay with friends. If nothing else, having that duffel packed and just sitting there was peace of mind. I highly suggest it, no matter where you live - you never know what might happen! Good (no, GREAT) info. And so nice it's all here in one spot. I know exactly what you mean, when I lived in the Philippines we had many a typhoon... I was too young to remember too much. But I'll never forget when the winds would whip through and our banana tree looked like it was going to break in half it would bend so far. Thankfully there was only one tsunami while we were there and it wasn't near as bad as the one in '04. Fantastic information! It is always a great idea to have a plan no matter where you live. You never know when disaster might strike. I pray your flood walls do their job and that this is a non-issue for the whole town and is over very soon to put your mind at peace. Thanks Tamy! I'd feel better if it would just stop raining/sleeting/snowing! It's sleeting right now, roads are going to be nasty tomorrow! Oh my gosh! Oh I feel so bad for people who this happens to. Great post of what to do! Praying for you, Barbara! What a nightmare! Here we are in a desert situation where just about any water is such a blessing & then to hear a first hand account of how dangerous it can be to have too much water. I'm really glad that you guys were okay. Great information! We don't have our 72 hr kits complete but we are working on a 6 month food supply. Might sound silly but look @ the survivors from Katrina & all they've gone through. Oh my goodness! I hope you stay safe!! My sister lives in Winnipeg, north of your area - I'll forward this link to her! Hi Barbara. I have an award for you at my site. This is a great post Barbara, filled with such good information. How scary for you thought...I'm keeping you in my thoughts and prayers. And btw, Happy Blogiversary, I think it's today isn't it? Thank you for all the thoughts... I really appreciate it. I know Fargo's been all over CNN, my thoughts are with everyone down there right now and praying we don't have any issues.